Would also like to point out to that Sydney is building the second metro line, Metro West, as well which will open in the late 2020s. A third metro line will also likely open in the late 2020s as well between St Marys and the new airport, they picked metro as the mode for the line for some reason but it’ll form part of a larger 60-70km North-South metro link. Sydney also has more lines under consideration as part of the Future Transport plan. Speaking of bus priority, the Transitways (T-way) in Western Sydney work pretty well too, there are bus-only lanes for the entire way on the T80 and T65 and there are a few bus-only grade separations too, mostly flyovers, cars have to use the normal intersection. It’s a shame they gave up on it. With all that Sydney stuff said, the Metro Tunnel should be capable of high frequencies during the off-peak. Metro style headways of 5-8 minutes between Sunshine and Dandenong (10-15 minutes on the branches counting Melton too) is easily achievable and there’s no reason why it shouldn’t happen. And isn’t what you call “Metro 3” (SRL) going to be a real metro? You could also build Metro 2 as a proper metro (Metro 1 has sailed). Just convert the Mernda and Werribee lines to a proper metro, like what Sydney is doing. Mernda doesn’t have freight so that’s easy and Werribee has lots of space in the rail corridor to build 4 tracks to separate the freight/mainline and proper metro services with a pair of tracks each. And no branching makes it a bit simpler to build it as a proper metro too. Another potential line is the “Metro 3” proposal from Melbourne City Council which would connect the Airport to Doncaster. The airport line is under planning now but I can see how it in the future to form part of a proper metro. 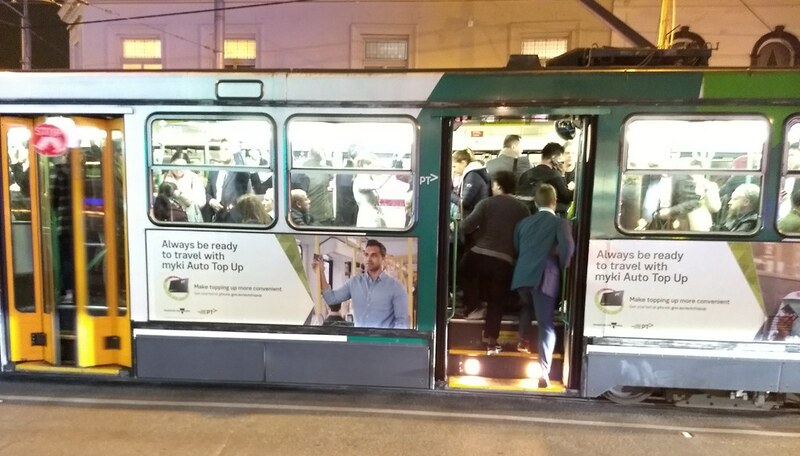 > The May 2018 Metro and Yarra Trams passenger load surveys were released last week. Is there a reason that one of the three public transport modes is not surveyed at all? I’ve been following how this is going for some time and unfortunately I’m quite pessimistic. A lot of what you’ve talked about here is fairly straightforward, and should be evident to the engineers, planners and public servants – but it isn’t happening. Somewhere along the line there is a failure to actually measure and work towards meaningful outcomes – such as improving access and mobility, decreasing the transportation costs to the economy etc. The focus is on outputs – building a projects or ‘things’ – but specifically working towards a desired set out of outcomes. This indicates that the department is incompetent, or because of political or commercial intervention the processes is not working. 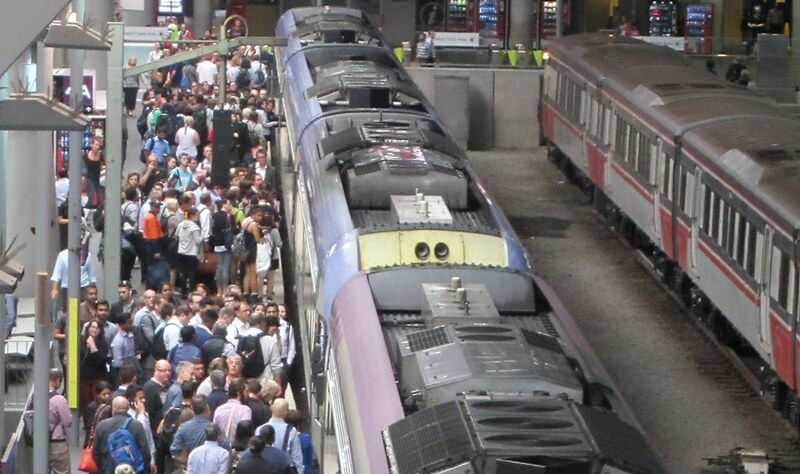 Regional Rail Link is a case in point – infrastructure was delivered – but how many additional Metro/VLine services have been delivered as a result of it? Has reliability and access to and from regional areas improved? Why haven’t the additional peak and off-peak slots been used? Just constructing railway stations and track is not a success, if the whole point of the project was to improve transport in the western suburbs, and on the western V/Line lines. The level crossing removals are popular, that is sure, but the Auditor-General’s report shows that the authority is failing to actually measure meaningful outcomes, and that is has not even figured out what it is trying to do. Is it trying to ease traffic? They have not been measuring this properly – how much traffic does it need to ease to be worth the cost. Is it enabling new trains? How many and when? When the Caulfield-Dandenong crossings were completed, no additional services were added resulting directly from it (some were added late at night, but they were always possible), so what is the actual outcome? They extended the train to Mernda, but how much will it improve access, given it takes an eternity to reach the city, frequencies are poor, services are overcrowded and connecting buses are poor. Would having also provided a higher level of service provided a much greater impact to the outcomes? Some other projects also reek of this – major tollway projects in particular. The projects are done for ‘the sake of the project’, the outcomes, justifications and economic assessments are fished up after it is decided that they will be done. A lot of people always seem to have the perverse opinion that screw the cost – we just need to do it – “because”, forgetting that they are literally the ones that will be paying for it. It is all our money after all, and the decisions made about how it is spent much we get back out of it. It is not just about the specific projects and funding etc., it is a much larger problem, and that is quite daunting. What an archaic process of observers with clipboards, followed by 4 months to manually process the data ! One of the supposed benefits of myki was the better statistics of where and when people are actually travelling. Was there a botched contract process, so that after 10 years of myki we’re still not getting out these statistics and instead having to employ manual observers with clipboards? What the system should be able to provide is the loading of each train, tram and bus service by the start of the following day (after all journeys have tagged off). 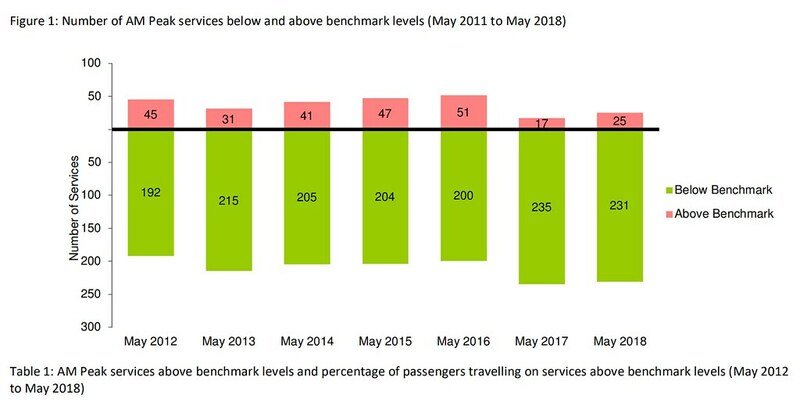 These stats would enable better service planning by the operators, ptv and the government, and summaries should be available on the ptv website, just as the “crowding” data are available on the V-line website. Instead we get this long lag period between observations in May and service planning decisions by perhaps the following March. Furthermore there are no publicly available data on off-peak patronage and potential crowding. When will ptv deliver on the promise made 10 years ago when myki was introduced? Glen Waverley PM more crowded than AM. No surprise there. The former runs approx. every 12 minutes and is subject to being affected by other lines using the city loop. The latter runs relatively separate to other lines direct to/from Flinders St approx. every 7 minutes. Actually, I might say Sydney seems to be coping in some aspects – at least the Government there seem to be investing in more public transport. At least one new light rail route is well under way (though not without controversy), with another being lined up for construction for the start of 2019. I think most of the trains in the inner city is 15 mins around the clock too. There’s also another metro line in Sydney under planning and investigation – although it’s still too early to say if that will go ahead. Finally, I notice that, since from back in 2012, Sydney’s existing trains seemed to be more reliable than Melbourne’s, though I will need to get back with some hard data, as my experiences were in 2012-present and 2006-2011 (I used to study in Melbourne.) respectively. Of course, it could do better. There are still a lot of areas without suitable bike lanes for starters (though the hilly terrain probably does not help), and chronic overcrowdings at Town Hall and Redfern Stations – especially with the latter overdue for a station expansion. Not to mention still a lot of suburbs without suitable rail lines etc. There is still a lot of investment on freeways as well, such as Westconnex. 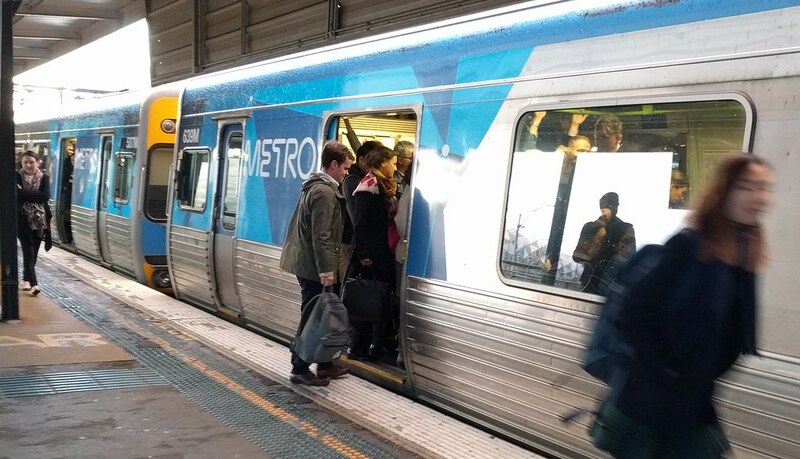 Interesting to see that crowding on the Werribee line is increasing. This is not a surprise, there is massive growth occurring there. Residents can have a choice of 2 lines to use if they want to drive to a station: either the metro Werribee line or the Regional Rail Link into CBD (new stations at Wyndhamvale and Tarneit). Ironically, many of the level crossings on the (metro) Werribee line that were given some priority by VicRoads in their 2014 report are NOT on the ALP list of top 50 to be removed. Yet instead there are “No Priority” stations at Ferguson St Williamstown (Williamstown line) and Kororoit Creek Rd North Williamstown (Altona line) both on the list. Which is evidence that the Level Crossing Removal Program was more about the ALP ‘ticking boxes’ with quick, easy xings, than a more strategic focus on public transport benefits and really making a dint in congestion on our roads. The ALP recently announced 35 new services on the Werribee line. It’s hard to see that these services will not cause huge problems at xings such as Hoppers Crossing (also not on the list) – which is also close to the Mercy Hospital and requires emergency access. Also interesting to see no statistics for the Altona line? Why is this missing? It is regularly bypassed by Metro by the way, so despite the ALP spending 82 million on removing the ‘no priority’ level crossing at Kororoit Creek Rd there is no improvement in the reliability of the train service on the Altona line. Reply to Cam: I agree with your comments, especially regarding the level crossing program. The Auditor-General’s report last December (nice timing, it came out just before Christmas, buried or what!!) was quite critical of the Program. Yes crossing removals seem popular in some quarters, abhorred in others where the outcome has been quite imposing (skyrail) or has simply made the area more dangerous for vulnerable users (eg. Buckley St Essendon, no cyclist lane in the new road under the tracks, despite it being on the Principal Bicylce Network. The Govt ‘solution’ was to remove Buckley St from the PBN!!). Agree that xing removals have also not led to an increase in train services, so a lost opportunity there. AND the congestion benefits are next to zip. See the results of the LXRA’s own post-removal surveys. In ALL cases, there was MORE traffic and only minor travel time savings of less than a minute. Billions have been wasted, the Program desperately needs to be reviewed/better targeted. If Sydney has more lines under construction, it is because the LNP Government in Canberra has decided to throw money at them, while restricting what it gives Melbourne. None of which excuses the Andrews Government’s failure to run regular services on the lines it does have. It’s also worth restating that most of the tram fleet is illegal and does not comply with the Disability Discrimination Act, and only operates under a dubious carve-out which was meant to be temporary. Replacing these would rectify a few faults. Ask anyone in Adelaide who uses their “O-Bahn” bus route from Modbury to the city whether they’d prefer a train, tram or their O-Bahn bus way. Guaranteed the answer will be the Busway. This system has been in place for over 30 years and is the most flexible and speedy transit system in Adelaide. Developed in Germany over 40 years ago to enable buses and trams to use the same right-of-way and being a fraction of the cost of laying heavy or light rail, yet able to use their dedicated Busway tracks (an actual guided track for buses where there is no need for the driver to steer the vehicle). Psychologically, transit passengers prefer a “guided track” (usually railway) rather than having a driver steer the vehicle and the risks of collision that go with that). For anyone not familiar with a guided Busway, Google it (Adelaide O-Bahn, or guided Busway). The flexibility of entering and leaving the guided busway from regular roadways without even slowing down is another aspect that passengers appreciate when using a guided busway. Having lived in Adelaide and used their O-Bahn, I tend to agree wholeheartedly with proponents of their wonderful system. It works so well in places of low to medium population density and as stated before, is much cheaper to build and maintain than heavy or light rail. There are so many potential routes in Australian cities where this could work exceedingly well. Can’t work out for the life of me why the concept is not used widely in Australia. The Werribee line had both extra peak trains (1 in each peak, a third of trains added (which is ridiculous considering that the survey covers some peak shoulder times that have plenty o space for extra services)) and the extension of the inter-peak Altona loop services too Flinders St, with accompanying conversion of inter-peak Werribee services to express services (1 train moved earlier into the morning peak and 4 in the afternoon peak (the extended services are in the earlier part of the evening peak/peak shoulder)) providing greater capacity and faster travel for peak shoulder and other inter-peak passengers (unless they travel between Laverton-Werribee and one of the stations expressed through). The survey also fails to collect any counter-peak data on the Ringwood/Alamein corridor, which is quite busy in parts of peak because of office workers (mainly East Richmond, Box Hill etc) and uni students (mainly Glenferrie). Hi Daniel, I am a long term train and tram user but only new to the public transport industry. I attended a presentation by Vic Bus Assoc and Monash Uni last week which talked through lots of issues affecting public transport and buses. I have read quite a few articles on your blog and there seem to be some announcements regarding more trains but many are pre-election announcements. In a meeting today with V-Line they had some reservation about what a Liberal Govt might do to public transport and regional trains. As a public transport user, I have not heard much from them (or don’t recall much).